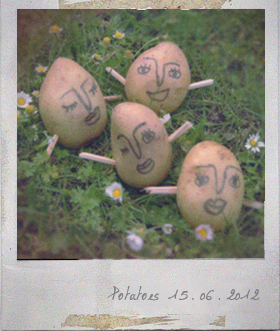 Potatoes are very friendly. They can get on well with almost everything. Break the garlic bulb into cloves (unpeeled), lightly crush them. Pick the rosemary leaves from the stalks. Place the potatoes in a pan of salted water, bring to the boil and cook for 6 minutes. Drain well and let dry for two minutes then Return the potatoes to the hot pan and shake it around to chuff up the edges. Place the potatoes, garlic and rosemary into the roasting tin. Drizzle the olive oil generously over everything and toss with your hands. Season well with sea salt and pepper. Bake for about 45 minutes or until golden and crisp. 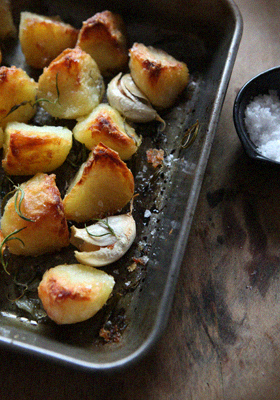 § 2 Responses to Roast Potatoes"
Also try to roast the potatoes with nutmeg and thyme ,it’s an excellent combination! You are currently reading Roast Potatoes at Fish Trip Cafe.